Earlier this month, we reported that Zack Snyder was considering making a movie about George Washington that would be done “in the style of 300.” He didn’t really say what that meant, but the implication was that it would feature a constantly shirtless Washington moving in slow-motion as he ripped the British apart with his axe and wooden teeth. Apparently, though, Snyder has really taken his many readings of The Fountainhead to heart, because even that patently ridiculous idea is somehow too small for him. Now, he’s moving past George Washington and going straight to every historical event ever. 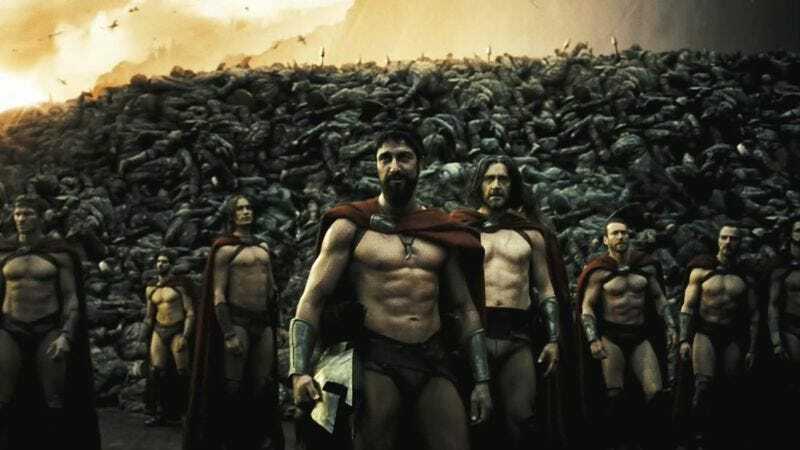 According to Collider, Snyder wants to expand the 300 series past ancient Greece and “use it as a framing device for other conflicts that happened throughout history.” He references his George Washington idea, adding that he has also considered the Alamo and “a battle in China.” Like 300, the stories would all revolve around a small military force taking on a much larger one, but once again, Snyder has avoided acknowledging that 300 was more of a fantasy movie than a gritty, historical drama. Would General Santa Anna in the Alamo movie be eight-feet tall? Would some of the British soldiers in the Washington movie have ninja powers or big saw hands? What is this battle in China? That could be the issue with trying to fit other stories into 300‘s mold. It has such a specifically nonsensical style that it might become harder and harder to tolerate in all of these different settings. That’s not the sort of thing that has ever stopped Snyder before, though, so he’ll probably just keep doing his specifically nonsensical thing no matter what.